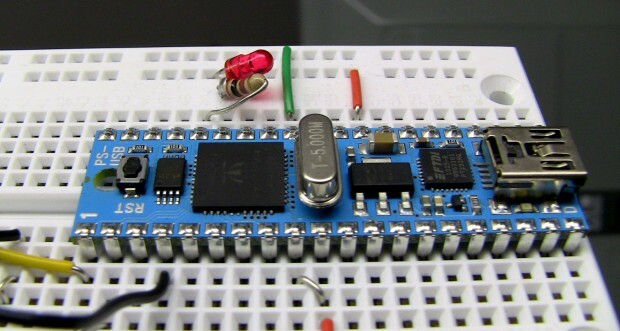 Have you ever finished breadboarding a project and upon reviewing your work observed that a large portion of your breadboard space was being wasted by your voltage regulation system? 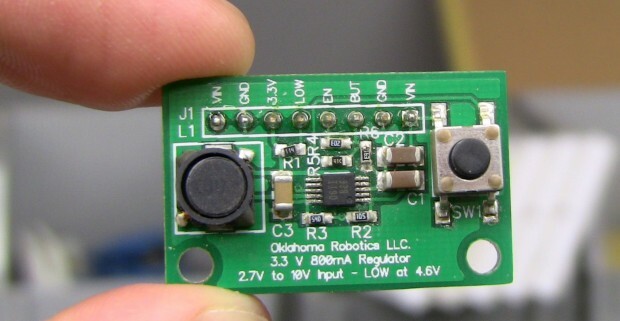 Have you ever wanted to use switching regulation in a high efficiency low power project? I do all the time, and I started working on a solution to this problem not too long ago. It started out as a breakout board I was designing for the purpose of prototyping a power supply circuit in our pan tilt zoom camera system. The requirements for the PTZ camera board were: switching voltage regulation, 3.3v output (for my beloved Propeller microcontroller), an input range suitable for use with 4 AA batteries, and a single momentary push button switch for turning the system on and off. As I lay out the circuit in Diptrace I got to thinking that since I was doing all this work already, I might as well make the PCB useful for other projects as well, so I designed the board with a breadboard friendly row of pins for use with a header strip. After changing a resistor value the board functioned perfectly (I was being a little overzealous on power conservation and specified a pullup resistor that was too weak). Well, it regulated voltage perfectly and the low battery indicator circuit worked great, but I still had some work to do when it came to interfacing with the Propeller chip. Nathan helped me find the right resistor combination to use to allow the Propeller microcontroller to correctly interface to the button monitor circuit and the regulator enable circuit. It would appear that when a Propeller is powered down the ESD protective circuitry creates a path to ground through the input pins. This presents a drain through an estimated 10K ohms to any circuitry connected to a powered off Propeller pin. Once the circuit was debugged I had a momentary push button switch that controlled power to a Propeller microcontroller. It functioned as follows: I hold down the push button supplying power while the Prop boots, once the Prop boots it takes over the task of keeping the regulator enabled, if I press the button again the Prop is monitoring the input and can act on my button presses, if I press and hold the input for x amount of time the Prop shuts down the regulator thus turning itself off. The behavior is similar to a computer where the same momentary push button turns the power on and back off, but the computer itself can also power down and theoretically prevent the user from powering off in situations where a hard shutdown would damage hardware or corrupt data. After getting a taste of the potential usefulness of the regulator board we decided to go ahead and develop it into a standalone product. 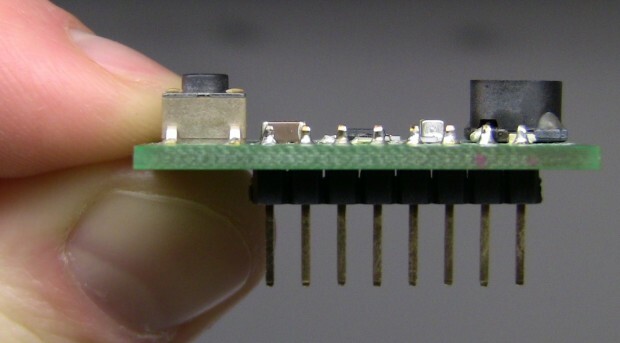 The design parameters are: full standalone operations (toggling is accomplished with an on board flip flop rather than an external microcontroller), optional microcontroller power override (ability to lock power on or turn power off), optional microcontroller button monitoring, a flexible power input port for various physical connection options (a pigtail with a PCB style connector on one end and a barrel plug, screw terminal block, bare wires, etc. on the other), and perhaps a power indicator LED on board. Of course, at this stage in the design, anything is possible! I finished a mostly functional prototype of this new and improved regulator board concept today. I had to dig up an old obsolete flip flop I had thrown out, but I did manage to get most of my design ironed out with it.